An Heuristic Prolusion was first published simultaneously by three groups in Canada: the e-journal Alterran Poetry Assemblage, Raddle Moon, and Friends of Runcible Mountain, a not-for-profit publishing collective in Vancouver, founded in 1998. An Heuristic Prolusion is available through their Documents in Poetics series. Why write, if not in the name of an impossible speech? What lies beneath my copy of eternity? What coils up...in spoken space? ~ Latent in speaking, in language, are freedom and hope, erecting a figure for the moment in which they are propounded, as advocacy for originary experience and revolutionary space. Memory as we have clung to it can be newly conceived. It is not accidental that there are epidemic losses of memory, just as the computer-body has risen to receive it, perhaps placing us further within reach of intuition, and peri-verbal sensation. The intuitive faculty passes over visible causes, drawing inferences very quickly. Language explores itself, much beyond its own stiff hug, in want of a spring ~ dramatist-exemplar of Explicate and Implicate Orders, respectively, unfolder, enfolder. ~ The unconscious is the center of our mental life, or at least�nearer the divine, and posits multiple centres from which to say. An imaginative response is one in which distinction between the emotional and intellectual has disappeared, and in which, ordinary consciousness is only one of many conceivable psychic elements. No judgment, but interrogation into the quality of life, via text limits. Projecting outward and multiplying the visible appearances, the phosphorus of the mystery. wanted to glow, wanted to glow. ~ Writing is my way of listening and ventriloquising until I reach the place of speaking. Or, in order to perceive, I create distance, and re-situate my own epistemological ideas of causation, separation and otherness. To find axis, or, an orbital angular moment, in rejection of its own centrality, always already disturbing its own refinement. To equipoise opposing forces, in their moving equilibriums, their tableaux. I wish you to write a book on the power of the words, and the processes by which the human feelings form affinities with them. ~ Quantum physics engages the term �qualia,� defined as, those temporary states flagging our �immediate� reality...�no more than dispositions...things that can float free.� The �redness of red, the painfulness of pain.� The whatness,�that which gives things qualities. Qualia are the essential feature of consciousness. Implicate order is the ground of perception, but also the process of thought. Down etymological spillways, a sensual oral audio-optic fibre, reaches across time and space, to begin a weave, or a cross, the meta-religious image, par excellence�Standing inside the ancient echoes, the unconscious is the heart of language. Crosspropositional, aestheological, ethicopolitical cloth ~ and sometime scathing political document. A vision of presence via absence�hidden, because all language about divinity dissolves in paradox and ambiguity. In world-wide ideological deadlock each part of the planet, persisting terrorism, and urging war. Enervated surfaces, against an arras of overwhelming bathos, in everyday speech. Prophetic utterance is magical in the sense of having the greatest possible penetrating power. ~ I take occasions of experience to be related to quantum events,...sudden and significant. Mind arises as an infinite expression, pan-experiential and permeated by proto-experiences. I want to work within or near consciousness-collapsing events. ~ And again, physics has an equivalence in its description that the very existence of an observer causes the collapse of the wave function. The wave function is a mathematical description of all the possibilities for an object. Could this not also be �self-consciousness�? ~ To respond, in making linguistic pav�s, to exhilarate transformation, with an art of perceiving movement, within being, within language physiques. And question...can we dispense with our proclivity to sacrificial structures? To subtend the map via fever-chart. To approach separation itself. An enactment of otherness. To exceed speech...language intensifies in retreat from its own nocturnal noise. I proceed�by letting develop intuitive notions and experience of order, extending to fresh fields of trans-semiotic, a priori intimacy. To be absorbed, and to wake. These are my methods. ~ Phenomenology, numinosity, discrete packets of light within words, family resemblance, synchronicity, appropriation, clinamen, imaginary acts, construction, animation, rhetoric, chance/non-chance maneuver, radical energy released at the boundaries of affinity and repulsion, at the gap between conceivable and presentable. Tribo-electricity, zizz, dispersion, anagnorosis (the critical moment of recognition or discovery, especially before peripeteia ~ sudden change or falling ~ a sudden turn of events or unexpected reversal), instinct, sound�as I found it, the culturing of surprise, leaning heavily at the mouth of my mouth, in a pointing toward that which withdraws. as we have said, the prophets use in their speeches, equivocal words and words that are not intended to mean what they indicate, according to their first signification. ~ I wish to question the vincula (connections) between grace and the abyss, Being in duplicity, apparency, things in their oppositeness, . not only as beneficence in a well of meaning, but as all that is falling, anomie...accidie, elengenesse. Inquiry as a kind of seeking, must be guided beforehand by what is sought. So the meaning of Being must already be available to us in some way. As we have intimated, we always conduct our activities in an understanding of being. the lord of language, silence, lies, rhetoric, signs, revelation, trickery. He is Lord of the double edge, embodies metaphor�s movement from one place to another, alien place, and the enrichment and risk that move entails. Outside explains inside, and vice versa. The two-way connection between them is fluid, ambiguous, mercurial, transformative and divine. He embodies the double meaning, the dual possibilities of utterance. He is the god of the possibility that my meaning, may not be your meaning, though the words sound the same. To defect�from the sobering circuit of...in a re-creation of subjective states, via scintilla. Words in their most ulterior natures, refusing centrifugal and centripetal social forces narrowing everyday exchange. �Blindly kissing out,� Tom Beckett. A fractious climb up over the atmosphere. ~ I delimit my world through interoceptive (a receptor of the viscera responding to stimuli originating from within the body), proprioceptive techniques, assembling, phrasing multiplicities where the containment of all the possible meanings moves beyond its own oscillation, toward a relation to some or all of those juxtaposed but shifting magnitudes. Atomic reflection, in beyond sense. I work with my own sense of speed and light, immanence, imminence, in the impossibility of self-prediction. "And the unconscious is the universe flowing in, inside"
~ By reading the disparate signs from the total phenomena in view, there is continual withdrawal from closed repetitive space and forms of social capture. Stricto-sensu�opening circulations between high and low culture, disorder and exuberance, to escape its frame of even utopian longing and flights to idyllic pasts. 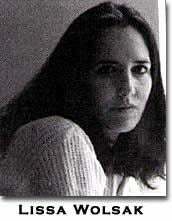 BIO: Lissa Wolsak is the author of the long poems THE GARCIA FAMILY CO-MERCY, Tsunami (1994), and PEN CHANTS or nth or 12 spirit-like Impermanences, Roof Books (1999). She works as a metalsmith in Vancouver, British Columbia.